when you are in the middle of calving and all you want to do is make cards and scrapbook!! Well today I got some time and I came up with these.. Using the Outlaw Designer Series Papers. Other: Lace, Stampin Dimensionals, bone folder. Both are easy to do! The match box is very easy to do but it pays to have a little practise with scrap paper first. I’m a lover of lace and buttons from way back but the lace was a RAK from a friend. Up2scrap ad ..If you see the latest Up2scrap magazine I have an ad in with my team of SU demos and I am offering a free ink pad of your choice if you order from me ($99 and over), This expires on the October 15th. and anyone can order from me! If you would like to sign up for my newsletter please feel free to email me for that. Coming up promos to ask me about ..Fathers day on the 7th. Catch me at the Whakatane Business and Leisure show and make a free card. The free wheeling Promo for September and World Card Making day on the 4th to 11th of October. Gotta go and update my other blog now..
Well done Delys, they look fabulous. These are awesome Delys. 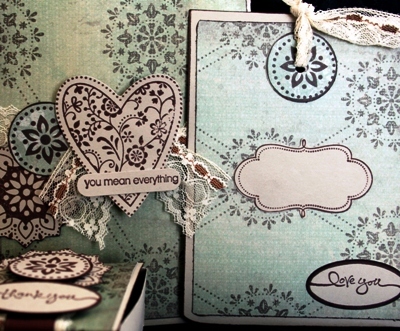 Lovely combination of colour and stamps. Can you supply the instructions, or a link to them, for the matchbox – I an on a 3D box kick at the moment. Hi congratulations I’ve nominated you for a blogging award – so visit me to collect it. gorgeous promotion of SU products. love them, thanks for the inspo! These are gorgeous! SO want that stamp set! Wow Delys, these are delicious!